Most of us do not know that as many as 20.9 million victims are enslaved in human trafficking globally. As the third largest criminal industry, human trafficking is a global crime that is tantamount to modern-day slavery. Experts have even predicted that human trafficking will overtake drug trafficking as the second largest criminal sector within the next decade. Technology has been a weapon used by human traffickers to recruit, exploit and abuse victims. A digital arms race is largely in existence. Now, the counter-trafficking community is turning the table on the very same traffickers by leveraging on technology. 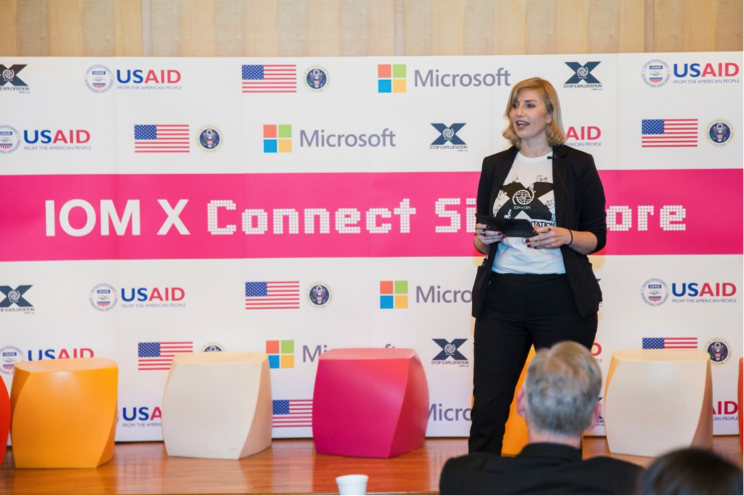 The event started with Tara Dermott, Program Leader of IOM X, who provided an overview of the IOM X workshop. The workshop was targetted at university students, aiming at helping them discover the technological tools that can be used to fight human trafficking. 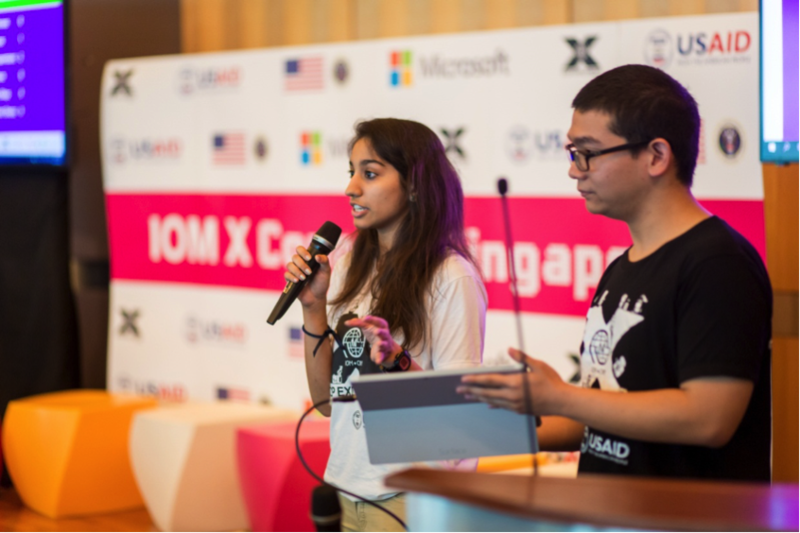 She introduced two students who took part in the workshop, Deepika and Greg, who then demonstrated a new IOM X app that was created to generate public awareness about human trafficking. This broke the ice and sparked an unspoken interest from the audience before the start of the panel discussion. 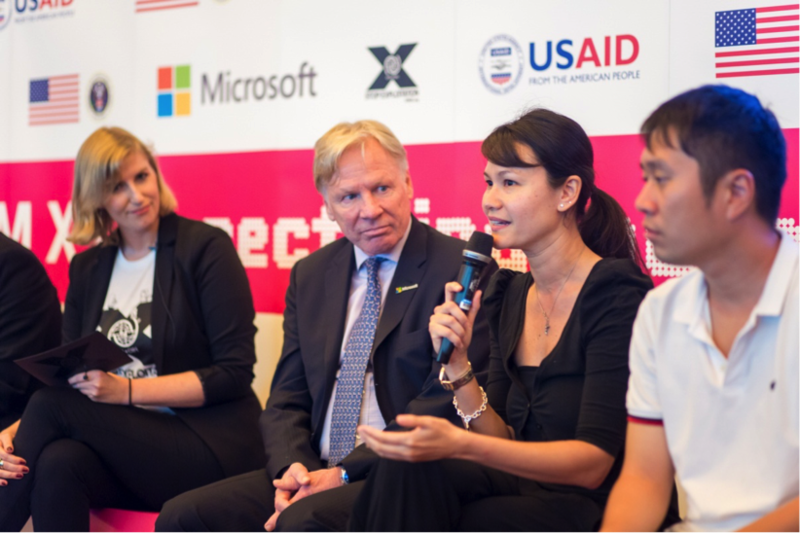 Made up of experts from the US Embassy Singapore, Microsoft and civil society groups (CSOs), the panelists discussed the power of technology, shared their campaigns and experiences, and they expressed the imperative to work together in the fight against human trafficking. The panelists were Blair Hall from the US Embassy Singapore, Stefan Sjostrom from Microsoft, Eunice Olsen, who is an Actress and Advocate against human trafficking, Mrinalini Venkatachalam from the UN Women Singapore Committee, Jolovan Wham from Humanitarian Organisation for Migration Economics (HOME) and Deepika Daswani, a student from Singapore Management University (SMU). The moderator, Tara, posed a question to each panelist, tailor-made to their area of expertise. Deepika shared her experience about asking people on the street to try out the human trafficking app. “People were really friendly about it and they enjoyed going through the questions with us,” she explained. “It was a good way to connect and young people felt slightly less intimidated”. Touching on the scale of human trafficking, Blair said that “trafficking has been identified as a government priority”. He pointed out the three dimensions to examine: protection, prosecution and prevention, as well as the existing technological tools for each area. 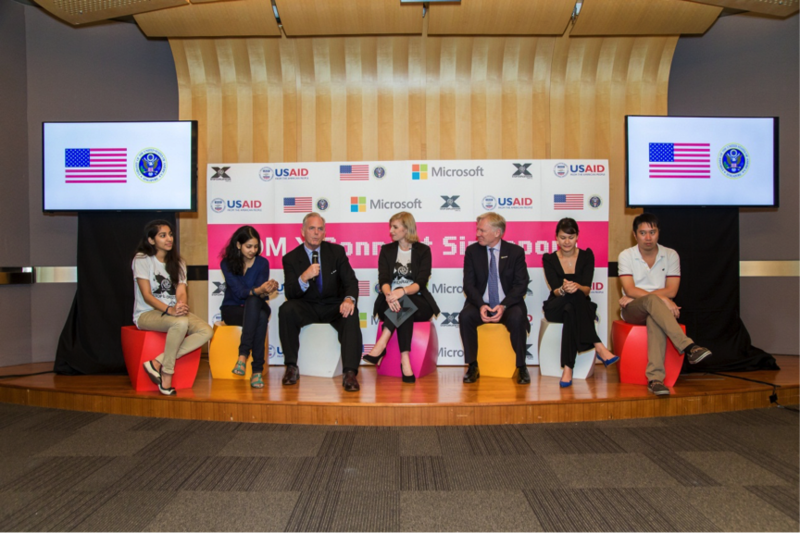 The US Embassy Singapore is currently using tools such as big data analytics for law enforcement purposes. He reiterated that understanding all the three dimensions is important. The moderator then asked Eunice to share more about her online anti-human trafficking campaigns that was proven successful. Eunice is an International Emmy Award nominated producer where she co-produced 3.50, a film on human trafficking in Cambodia. She shared about communicating messages through the media to raise awareness and also inspired her to co-produce 3.50. While there are many forms of media, Eunice feels that film is a suitable platform to initiate a dialogue on human trafficking. A short clip of 3.50 was screened during the panel discussion and Eunice brought up the importance of sticking to ethics. She unveiled that the film was pieced together after conducting research on how trafficking works, talking to social workers and then ‘injecting as much information in about trafficking through the character’. No victim or survivor was mentioned in the film. According to Eunice, film as a powerful media platform, fused with social media, has sparked an interest from young people whenever 3.50 has been screened in schools. The other panelists also agreed that social media had an influential role to play. “Getting the education piece out is really important and today there is no better way of doing that than through social media, through technology,” said Blair. Tech giants like Microsoft have utilised Information and Communications Technology (ICT) to empower individuals, communities and organisations. “There is a lot of good people out there if we provide them with a vehicle to participate to make things better. A lot of people are willing to spend time, effort, and even resources to help victims out there. And we facilitate that in a safe environment, as we certainly have with IOM X,” said Stefan. “The government can’t solve human trafficking by themselves. Regardless of our status – be it civic organisations or international organisations, we all have to work together to combat human trafficking,” added Blair. This article is contributed by Roshni Kapur. If you’d like to submit a story, you can do it here.